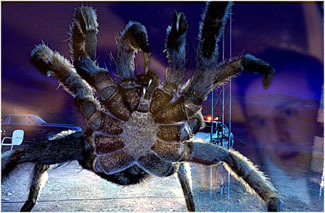 While no one would mistake Eight Legged Freaks for a Jack Arnold movie (theres no attempt, for example, to offer even the thinnest rational explanation for this unnatural course of events), theres more than a little Bert I. Gordon going on when the town of Prosperity, Arizona is attacked by a legion of overgrown arachnids. Originally titled Arac Attack, the film got a name change last September when a concerned marketing department worried that people might mistake the Arac of the films original title for Iraq, mistaking the big bug extravaganza for a film with a terrorist theme. The only terror in Prosperity is the result of a toxic waste spill that affects the local food chain, starting with the crickets that are the mainstay of the spiders at the exotic spider farm in town. After eating a few of the toxic crickets, the spiders begin to grow to gargantuan proportions, making mincemeat of the local population, including a herd of ostriches that are part of the mayors economic revitalization plan. Devlins aim was to find a balance of humor and scaring the heck out of the audience. While the scales tip a little heavily toward humor, the film still has its moments. With at least four species of spiders with varying methods of trapping their prey, people, parrots, and even ostriches disappear in the blink of an eye. The spiders, which Devlin describes as slightly gremlin-like, are the stars of the film, with David Arquette (Scream 13, Ravenous), Kari Wuhrer (Sliders), and Rick Overton (The Secret Adventures of Jules Verne) as a supporting cast. As a child, Devlin loved to watch the Saturday afternoon Creature Feature with his friends. They made us laugh. Wed make fun of themthe cheesy stories and the special effects. But that night, we wouldnt be able to sleep. As an adult, Devlin has made a career of celebrating those classic films that once kept him awake at night. Devlin describes his first film, Stargate, as his ancient Egyptian epic, a movie in the tradition of The Mummy, but one with a sci-fi bent. Having ventured into giant reptiles with Godzilla, and alien invasion with Independence Day, Devlin wanted to return to the B-movies of his childhood. Eight Legged Freaks, however, is a far cry from Devlins earlier event films. Eight Legged Freaks was envisioned as an old-style B-movie, and has the budget to prove it. What big money there was in the budget went into creating big special effects. The bar is so high these days, and we didnt want to have cheap special effects, Devlin said. Even with the big special effects, ELF was made for $30 million and in less than forty days. As a result, ELF doesnt carry the same pressure as Devlins earlier films to bring in millions at the box office. Given that Eight Legged Freaks was conceived as a B-movie from the start, why not sidestep the major motion picture industry and go straight to video? Nothing will replace being in a dark theater with a bunch of people, Devlin said. Its still too early to tell just how successful Eight Legged Freaks was, and we wont know until it hits the video stores. If the film appeals to audiences the way Devlin hopes it will, this could be the harbinger of a whole new era of the B-movie.